For the average consumer, the FRIGIDAIRE FAFW3801LB should be enough despite the fact that it does not have the same capacity and options offered by other Affinity series washing machines. This washing machine model does offer durability, energy bill savings and quiet operation. It is highly recommended to average-sized homes that require only the most basic wash cycles. Energy Star certified like most other environmentally-conscious and responsible appliances. The washing machine may not have an Energy Star option, which should reduce energy consumption by a further 60% but it can already deliver the much needed savings. One way the washing machine consumes less energy is through its speedy washing made possible by its trademark TimeWise feature. Vibration Control system and Silent Design feature. To create a serene laundry environment, washing machines from the Affinity series perform with minimal to no noise and vibration. five wash cycles, which include the most basic types of cycles. It does retain the Fresh Water rinse feature. This feature takes away as much of the detergent and additives during rinsing as to avoid causing allergic reactions to people with sensitive skin. The WashSense technology is also part of this washing machine, ensuring the cleanliness of each load. 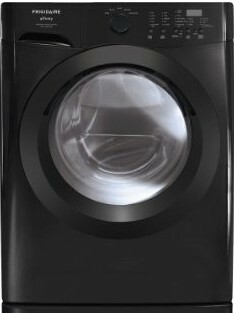 Unlike other Affinity series washing machines that include Delay Starts of up to 14 hours, this ones Delay Start feature provides a range of an hour to 10 hours only. The Stay Put door, secures the opening of the washing machine to prevent accidents and to enclose the freshness of the load in. The consumer can only open the door when the appliance is off or if the Add a Garment feature is selected. This particular washing machine has a classic black exterior. Another color option is classic white. A 15 inch pedestal drawer is included. The consumer may also buy optional accessories, such as the mobile home installation kit and the dryer stacking kit. Express Select controls. There are also status signals for different stages of a cycle. The silent operation and no vibration features are present in the FRIGIDAIRE FAFW3801LB. Consumers do not have to fear loading the maximum capacity of the appliance because there won’t be the expected racket. Energy Star certification ensures savings on energy bills. The TimeWise feature also contributes to the savings. The door, during operation, is secured. So, the FRIGIDAIRE FAFW3801LB washing machine can operate even around young children. The door won’t open unless the cycle is finish or if the Add a Garment feature is selected. Highly programmable, the consumer can choose settings that best satisfy his load of laundry. The Save a Settings feature enables the system to automatically stores the last settings used. There are not a lot of wash cycles to choose from, at only 5. It is not NSF certified.